Living in Japan Part 2: Getting Your Residency Started | What can I do with a B.A. in Japanese Studies? As I wrote previously, this series of articles will detail some of the standard processes of getting your life started in Japan on a more permanent basis (for example, staying for a year or two) in a place of your own. Last time I talked about how to prepare before you leave, from packing to planning for your arrival. I’m also including useful links to other articles around the internet that helped me along the way. Today I’ll be talking about the first steps you should take after you arrive and what to expect. Questions and comments welcome! As of July 2012, Japan instated a new residency management system (在留管理制度). This means that at your first port of entry (airport) you will be issued a zairyū card that details your visa information. This is in place of the old “alien registration system.” If you already know the address where you will be staying, you should hand this over to the agent who will create your card. This card does NOT, however, excuse you from registering with your local ward or city office. Within 14 days of finding permanent housing, you should go to your local municipal building to do your resident registration (jūmin tōroku 住民登録). You can usually google the location of your local ward office or ask at a police box where it is and find it fairly easily. Most everyone knows where their local office is because they have to go there for various everyday tasks. 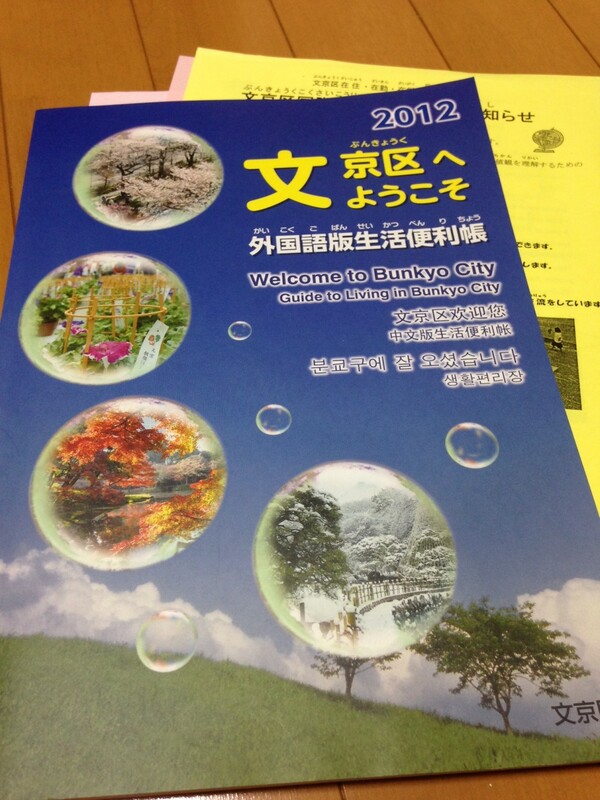 Some websites will have handy guides with addresses by ward, like this one for Tokyo. Although most places are willing to accommodate your needs as a foreigner and let you just sign things, it WILL make your life much easier. The best example is for banks—they will warn you that it’s fine for you to use a signature when you register/open your bank account, but you will need to be prepared to identically mimic that signature at any point in the future that the bank needs it. This is why it’s so much simpler to have a hanko you can just stamp identically every time. Although some hanko shops would make kanji hanko for foreign residents without legal kanji names (mainly people of Chinese or Japanese descent), the new system requires anyone without a legal kanji name to use katakana for their official hanko. You can also register your hanko with your ward or city office. An example of a store that makes hanko. So where can you get hanko? The answer is just about anywhere. You can have hanko made at larger chains of stores like Tokyu Hands or Hanko21, or you can ask around or wander the streets. 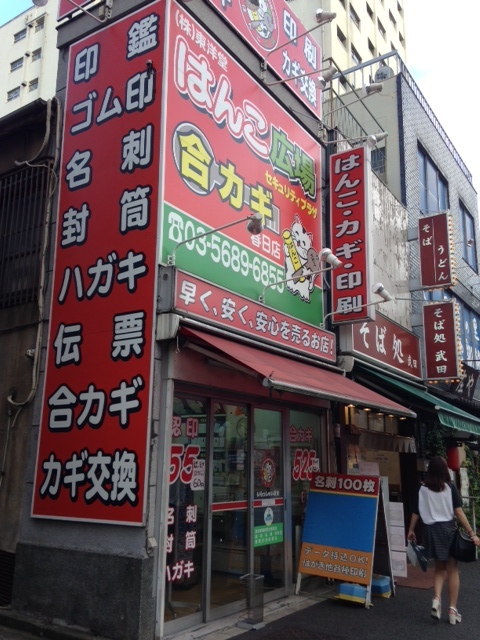 You can usually find within 10 or 15 minutes of anywhere you are a store that will have signs saying はんこ, 印鑑, or 印章. The picture shown here is one of two local hanko stores within a 5 minute walk from my apartment. There’s no need for you to have an extremely detailed or expensive hanko—mine cost only ¥1,000 ($10). Well worth the amount of stress it will help you avoid later. Before you even get to Japan, start doing online searches for apartments in the area that you want to live. This will help you prioritize what it is you really want out of your living space. Is it going to be size? Convenience of travel to work/school? Is rent/the cost of living going to be the most important factor for you? Searching online will also help you become more familiar with vocabulary and the general cost of apartments in the area, so you know whether or not a price is actually suitable for what you’re getting. (Also, many real estate agents will have information on how far it is from bus stops, temples, supermarkets, etc.) Be sure to check, especially for older buildings, if it has vents and fans in the bath. Again, I think this is really important if you want to ask yourself what your commute will be like and what types of housing/businesses/schools may be in your area. When I began my apartment search, I asked other friends who were living in the Tokyo area what neighborhoods were particularly good. They had all kinds of advice about the reputations of some areas or the ease of travel in others. This was especially important for thinking about whether there were trains, subways, or buses that would easily and cheaply get me where I needed to go. Make a best case/worst case scenario budget. Unlike renting in America, where what you see is what you get, plus 1 month’s rent (typically), Japan has a lot of hidden costs and fees many foreigners will not be aware of. Depending on how expensive of an apartment you want, costs at the outset could get as high as $4,000. I’ll go into detail about this (with real figures) in my future post. This step can wait until you get to Japan, because real estate companies (fudōsan不動産) are literally everywhere. You can walk in and immediately start looking. Generally speaking, I will say that apartment hunting as a foreigner has become easier in recent years thanks to the housing crisis, particularly in large cities like Tokyo. People who otherwise would not rent to foreigners are now being forced to reevaluate to fill large numbers of vacant apartments, to our advantage. However, in some places, like Kanazawa, for example, you need a guarantor [work or school] to be able to access a lot of real estate businesses outside those like Leo Palace. I’ll give the specifics on what you need to rent and how to search in my next post. Now that you have your new address, within 14 days you must visit a municipal office to register as a resident within your ward (ku 区). In most places, this is at the kuyakusho 区役所, but in some cases it might be that your area is run by a city office instead (shiyakusho 市役所). Here you will do your resident registration (jūmin tōroku住民登録) as well as register for National Health Insurance (NHI), or kokumin kenkō hoken (国民健康保険). Both can be completed that visit (although if the NHI section is busy they might mail you your card). Health insurance registration may be covered through your office, so check with them, too. For resident registration, be sure to bring your zairyū card (they will be putting your new address on the back of it! ), your passport, your hanko, and to have your address on hand. I believe I brought my real estate contract just in case as well, which was helpful because they wanted to know the contact information of my landlady, and I did not have that memorized. The staff helping you will typically ask you to confirm the location of your building on a map and double check all the information you’ve provided. Be prepared to write your full name in katakana (sometimes I forget about my middle name on forms and they made me go back and redo parts of the forms). One of the great things about registering as a resident is that the ward office will give you all kinds of informational packets about your place of residence. If you’re in a large city, they’ll typically have an English language version that will also explain disaster preparation, how to divide trash, etc. You’ll get maps and guides to local institutions and businesses. If you can read Japanese, you can also go to the ward office website and find lots of neat information on other local events. My ward office site, for example, lists local flea markets and fairs. At the same time as you register for your residency you can also (usually on a different floor) go and register for National Health Insurance. People who are in Japan for more than 3 months are eligible for NHI. The amount you pay by month is also based on your previous year’s income within Japan, so if this is your first year in Japan, then you will probably pay as low as about $15 per month for insurance. Although you may have insurance through your school back in your home country, or through a fellowship program, I would definitely recommend getting on Japanese National Health Insurance. It is accepted basically anywhere, does not cost much, and will save you SO MUCH HASSLE. It is very comprehensive in coverage. Even though I have two other kinds of insurance (through my school and fellowship), I still registered. Everything is much simpler and cheaper this way and you rarely, if ever, have to worry about finding something “in network.” Many friends have reported to me that most of their visits have cost under ¥4,000 ($40) including prescriptions and treatment. Once your residency is registered on your zairyū card, you can take it to go buy a cell phone. Note that the cell phone industry in Japan is singular, meaning that your foreign cell phone will most likely not work in Japan, and your Japanese cell phone cannot be used in the US. Fair warning: I only recently bought my very first iPhone, and admittedly don’t understand cell phone plans very well even in the States, so I’m no expert on what’s out there. I’m providing a number of informative links online below, and giving general information and advice on the process below. Depending on the length of time you intend to stay and what features or amount of usage you want to get out of your phone, you may go with a standard phone, a prepaid phone, or some other option like month by month (the latter two of which I’m afraid I cannot offer advice on). If, like me, you are rather ignorant of cell phone plans (even in English) and worry about knowing the specialized vocabulary for signing a phone contract, you may want to find a branch with English-speaking support staff. Companies like Softbank list these locations online. I was far too jetlagged and concerned about getting weird additions to my contract without knowing to attempt a Japanese-only signing, so I went to the Softbank in Ginza, where everything went smoothly (in about half English and half Japanese). BE AWARE that you may have extra fees to look out for. For example, there were about ¥2,000 ($20.00) per month of extra items on the contract that I had to talk through carefully with Softbank reps. About half of that was insurance for the phone (in case of loss or breaking it), but two ¥500 charges were services I didn’t need, like subscriptions to movie/music apps on my phone. I had to call the company within a week to opt out, and could not opt out while in the store. Also, a standard cell phone contract is typically 2 years, and they informed me that if I cancel before my two years are up, there will be a cancellation fee that amounts to roughly $100.00. If you are paying off the phone itself on a monthly basis, you will have to pay for the remainder of that, too. (If you have a longer visa, you might be able to do this, but for a 1-year visa, you may have to use a credit card or pay for the device upfront, about ¥60,000, or $600.) Important to keep in mind if you’re going to be strapped for cash at the end of your stay in Japan. Cell phone companies will also be keen on charging their bills directly to your credit card. You typically have to manually submit forms to change this to a bank transfer option, and will be charged extra to receive paper bills if that is what you want. This may, however, vary by company. If you have any particular experiences with setting up cell phone services, regular, prepaid, or otherwise, please add to our knowledge in the comments! In order to open a Japanese bank account, you will need your zairyū card, your hanko, and your passport. You may also want to bring some other kind of proof of residence just in case (or if you still haven’t gotten used to writing your new Japanese address). Some banks want you to have resided in Japan for more than 6 months before opening an account, whereas others will be more flexible to foreigners. Be aware that some universities have designated banks for students, so if your affiliation for research or school involves official enrollment, be sure to consult someone on staff about where is best to go. Personally, I signed up with Shinsei Bank (新生銀行), which is an internet-based bank that is extremely easy for foreigners to sign up for, as the system is bilingual. In the Tokyo area they also have a couple of branches with English-speaking staff for those of you who have little to no experience opening up an account. It was very easy to do and did not take much time at all. Japan Post is also really good, is often used by foreigners, has nationwide ATMS, and includes bilingual screens. Most banks close in mid-afternoon (around 3 pm). Most bank-affiliated ATMs are closed in the evenings, on weekends, and on national holidays. ATM cards, or “cash cards” in Japan do not work like debit cards in the U.S. or other countries. Be prepared to take out cash often, as Japan is a largely cash-based society. You can set up your utilities payments through automatic bank transfer with your account, and this is a totally normal way of paying your bills and should incur no extra charges for automatic withdrawals. The Department of State now strongly suggests that Americans traveling outside of the U.S. register with their Smart Traveler Enrollment Program (STEP) program so that it is easier to locate citizens in an emergency and convey important security information through the local embassy. While this may not be everyone’s bag, it can be very useful. For example, not a week after my arrival in Japan, the embassy released statements warning about the outbreak of dengue fever in my area, which is the first such outbreak in Japan since the end of WWII. Given the EXCESSIVE number of times I have been bitten by mosquitoes this summer, and the fact that I live near a lot of park areas with water, this is good information to have. I also receive notices about severe weather (typhoons headed directly at Japan, etc.). It costs nothing to register, and amounts to you providing your address, contact info, and an emergency contact. Well, that’s it for now. I hope this general guide has been helpful for laying out some of the first steps you’ll want to take upon your arrival to Japan! Please feel free to comment with your own advice or experiences or link us with any other resources you found particularly help on these topics. Hopefully I can also answer some questions you might have! This entry was posted in blogs, culture, graduate school, housing, living abroad, main posts, study abroad, undergraduate, useful links and tagged apartment hunting, apartments, bank account, cell phone, hanko, living in Japan, national health insurance, real estate, real estate agent, registration, resident, resident registration, seal, STEP, zairyu card. Bookmark the permalink. So, you have to get your hanko in katakana now? That’s a shame. I mean, I can imagine having a hanko with my actual name on it in katakana would be more professional and adult, in a way. But, I was kind of looking forward to getting one that just said 寅, or 虎, or maybe 蔡 (which reads like the first part of my surname), and just using that. Oh well. Apparently this is the case (I believe Leah told me). But this won’t stop you from buying a random one at a 100 yen shop, I imagine. Of course whether or not they’ll tell you you can’t legally use it… no idea! Pingback: Living in Japan Part 3: Apartment Hunting Basics | What can I do with a B.A. in Japanese Studies?